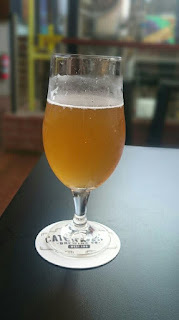 West End is quickly becoming a force to be reckoned with when you talk about where to get the best brews and eats in Brisbane and the addition of Catchment Brewing Co. simply strengthens this even more. Catchment is the second brewery in the last 12 months to take up residence in West End and it's great to have so many craft beer venues with good food all condensed in this one little area. Located at the Vulture street end of Boundary, Catchment is fairly easy to get with a 10 min walk from South Brisbane Station and the Cultural Centre bus way with plenty of buses going right into Boundary street as well. Catchment's art deco style exterior has been left intact and fits quite well into this architecturally older section of Brisbane. Inside is a clean layout of polished concrete, dark wood and black steel and out the back sits beautifully shiny brewing equipment in the middle of a large decked area with plenty of seating and some excellent murals on three of the walls giving a really fun vibe in quite a new looking space. Currently there are two house brewed beers on tap with Colonial Ale being a fairly refreshing golden ale style beer and Pale Select which hopefully requires no explanation..
For me the Colonial went down a treat on a rather hot Brisbane day but I wasn't enjoying the Pale really at all, tasted a bit sweet and wasn't finding much character in it. Catchment also has a great selection of wines, a few ciders and plenty of bottled beers if you want to try something that's not on tap. The food has a really nice range from seafood like oysters and mussels to share platters of meats and cheeses as well as pizzas and burgers containing slow cooked meats. On the day I chose the Beef Brisket Burnt End burger with slaw on a brioche bun, the slaw gave a really nicemustard kick and some sweetness from the sauce but the burnt ends weren't as crunchy and roasted as I'd have expected and were a little chewy but overall it was pretty delicious! 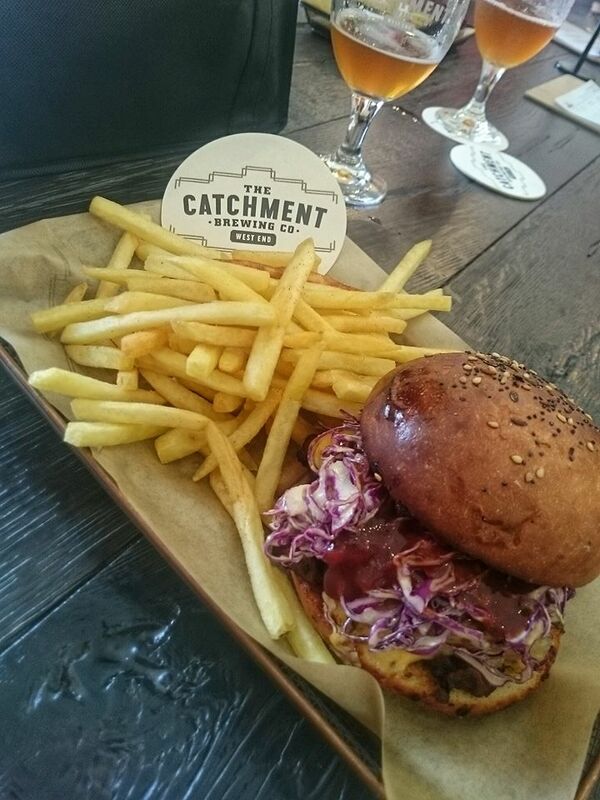 Catchment is a welcomed addition to what is slowly becoming one of the best strips for a craft pub crawl in Brisbane and as it is still in it's infancy I'm sure the beer and food will continue to evolve.